Nothing like a shop hop in the rain. Unless it’s a shop hop in the rain with your edgy 10 year old son. However, he did man up and take charge of the GPS, and we stayed completely on track the whole day. Only 25 more shops to go. He also helped me find some really nice fabrics…and he found a few of his own as he scheduled my time to make a quilt for his bed. All in all, we got to 7 quilt shops today. 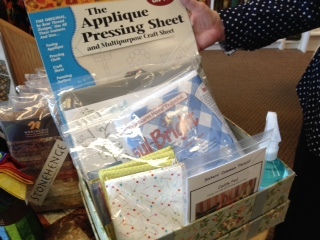 We were given permission by all shops to show their raffle basket, so here goes! 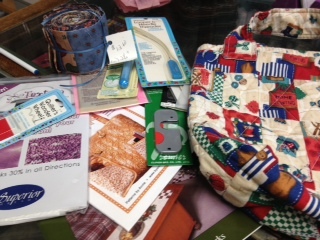 Sewing Concepts in Carpentersville: Small shop but loads of Janome sewing machines and fabric with a very cheerful and helpful staff. What I bought: Some fabric for a quilt for my nephew and niece and their new baby. A side note here. The construction near 72 and Randall is a nightmare. Traffic was held up while the lights changed several times. We were pretty backed up on 72 trying to get from Dundee out to Hampshire. If you can find another route, take it. I’d try to avoid this intersection. What I bought: More fabric and a charm for my scissors so they don’t get mixed in with someone else’s at a class. 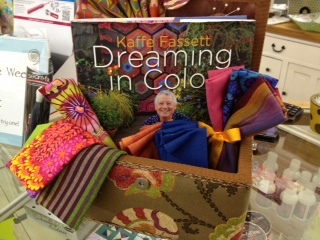 Tidy little store with lots of lovely fabrics–brights and batiks. I would have spent more time browsing fabric but my helper was ready to go. 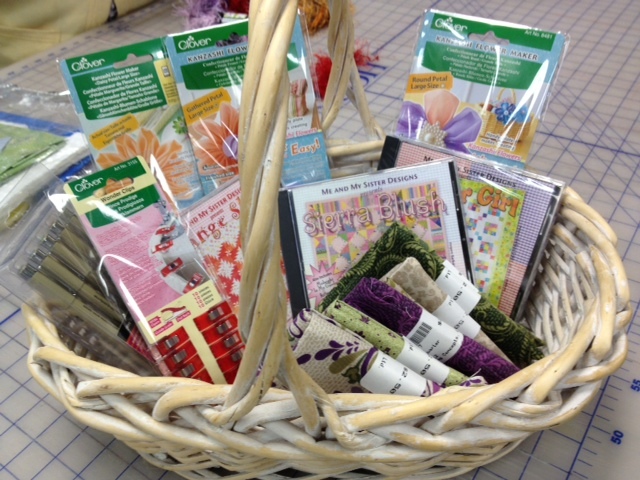 What I bought: More fabric and a “Seam Fix” tool. I’ve been looking for one of these. It’s just a seam ripper with an eraser on the end to easily remove all the tiny threads on a ripped seam. Reluctant Assistant comment: “I found a fabric stack (a layer cake) that will make me gain 97 pounds!” (Fabric with all snack foods on it). Tiny little building that might be easy to miss…look for the bright teal door! She had a nice selection of fabrics and was very helpful with directions. 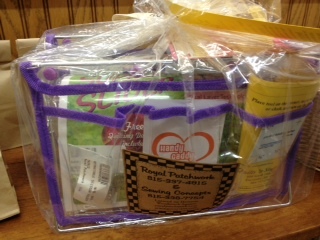 Her raffle basket is actually a quilted bag. So we took the goodies out of the bag to display them. What I bought: More fabric..imagine! One of the larger shops with machines and fabric. They were helpful in providing lunch menus to local places and offered suggestions. What I bought: Found some lovely fall/winter fabric — perfect for placemats! The square in Woodstock is really a charming place to visit–even in the rain. The Public House looked like it had a wonderful menu, a place I would have loved to try. Alas, we were on the lookout for a place with chicken fingers and fries. We ate at the BBQ King Smokehouse– tiny, but the pulled pork and sweet potato fries were pretty good. You can also find a number of other interesting shops along the square, so you may want to take your time through Woodstock and enjoy it a bit. Big, bright and airy shop with lots of new fabric lines and an emphasis on contemporary and youthful fabrics. School was just out in Crystal Lake and teenagers wandered in and out of the shop. Fun! I had to take a quick pic of her “button wall”. What I bought: More fabric of course. 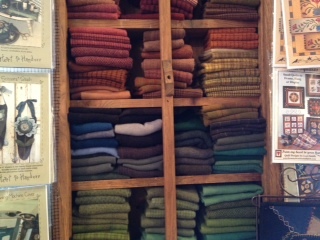 Lots of primitive, darker colors, with lovely cozy quilts. Wonderful selection of felted wools, even on the bolt. 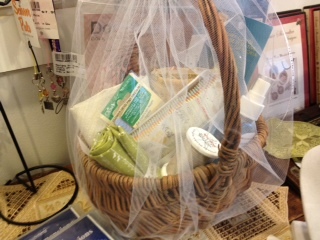 I’ll post their basket as soon as they send a pic to me! What I bought: Some felted wool. This entry was posted in Creativity, midwest, Northern Illinois Shop Hop, quilting and tagged Northern Illinois Quilt Shop Hop by edges. Bookmark the permalink.